When using SAML login with ADFS, you can pass other values in addition to the authentication values. This article describes how to pass a user's full name, organization, phone number, role, or custom role. 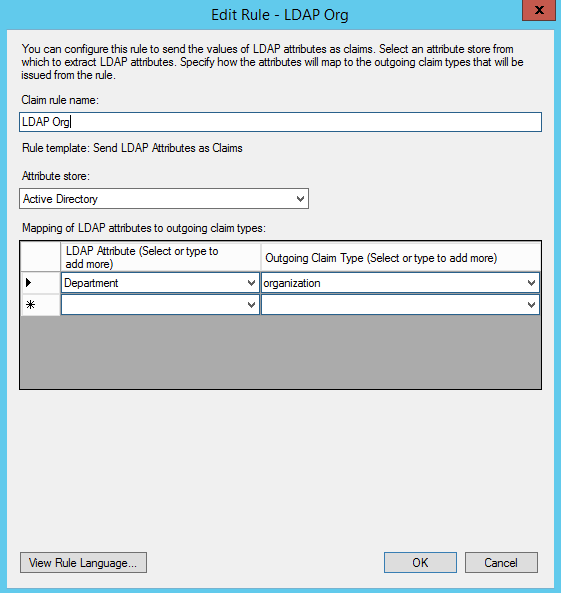 To pass the full name of a user, create a rule with the Send LDAP Attributes template. For the LDAP Attribute, add a row for Surname and a row for Given-Name. For the Outgoing Claim Type, select Surname and Given Name. To define the organization that a user will be associated with in Zendesk, create a rule with the Send LDAP Attributes template. 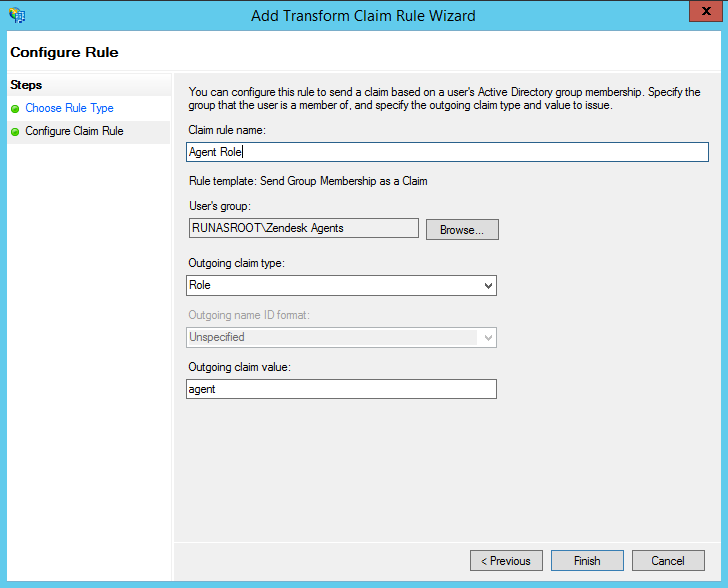 This rule will map a field in Active Directory to the outgoing claim type of organization. The LDAP attribute will depend on how you wish to map users. For example, you might want to map departments to different organizations. 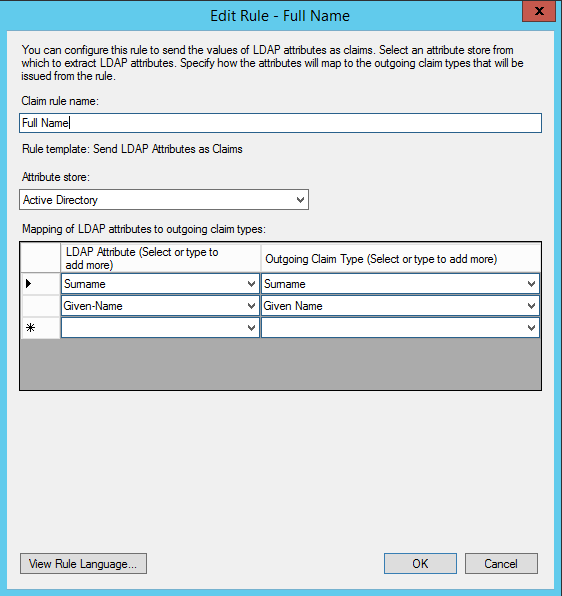 For the LDAP Attribute, select the field you are mapping to organization. For the Outgoing Claim Type, type the word organization in lowercase in the field. 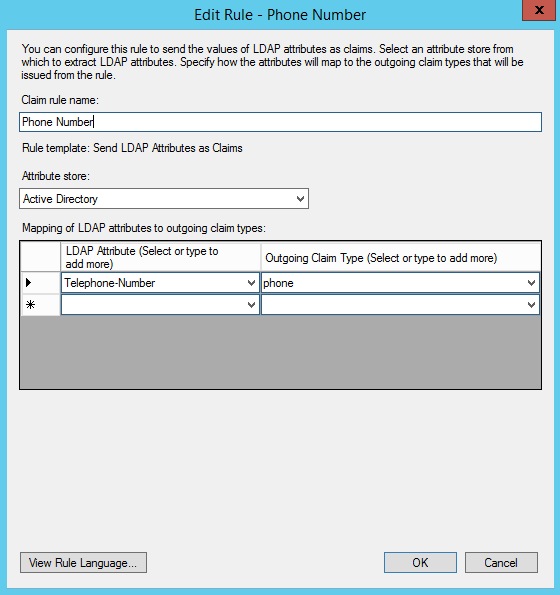 To pass the phone number of a user, create a rule with the Send LDAP Attributes template. For the LDAP Attribute, select Telephone-Number. For the Outgoing Claim Type, type the word phone in lowercase in the field. Setting the role of a user based on their membership in a group is a two-step process. 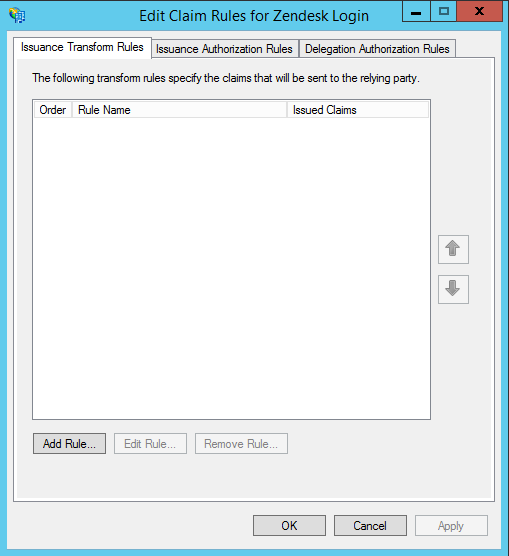 First, you create a new rule using the Send Group Membership as a Claim template. Second, you modify the definition generated by that rule slightly to create a custom rule that correctly passes the information to Zendesk. 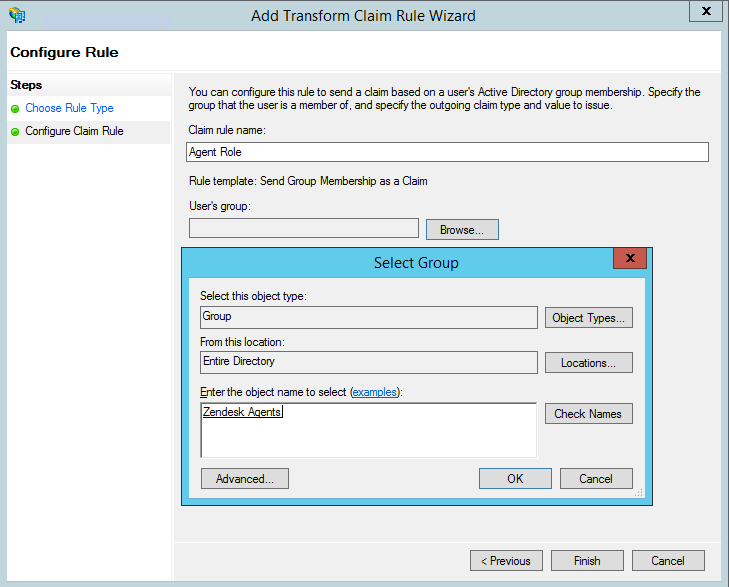 Add a new rule and Select Send Group Membership as a Claim for the template. Locate the group that you wish to map to the role by using the Browse button. 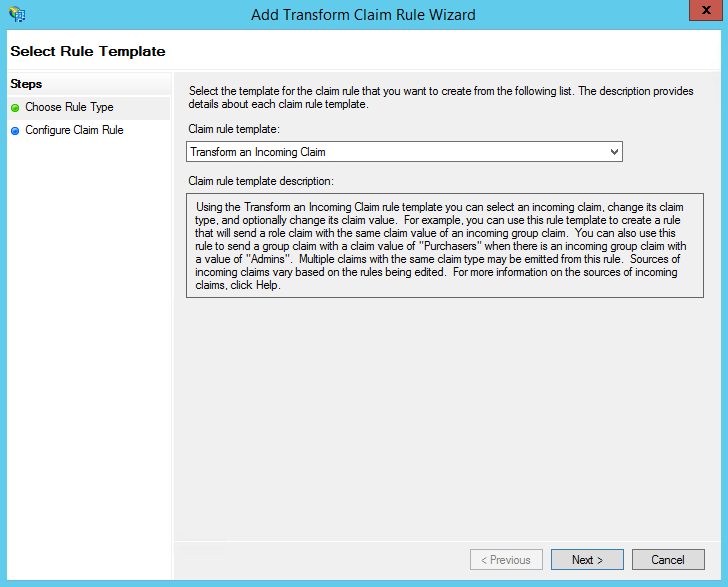 For Outgoing claim type, select Role. For Outgoing claim value, use the value specified in the user attributes table on our SAML documentation. Click Finish, then click Edit Rule for the rule you just created. Use the View Rule Language button to get the raw code for the rule. Copy the code somewhere. You'll use it in the next step. After copying the code from the rule language window, click OK to close the dialogue. 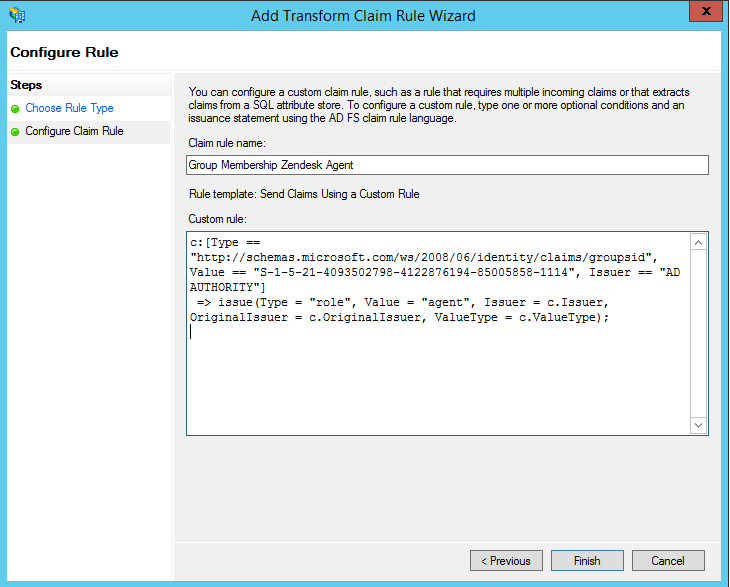 Remove the rule and add a new rule with the Send Claims using a Custom Rule template. 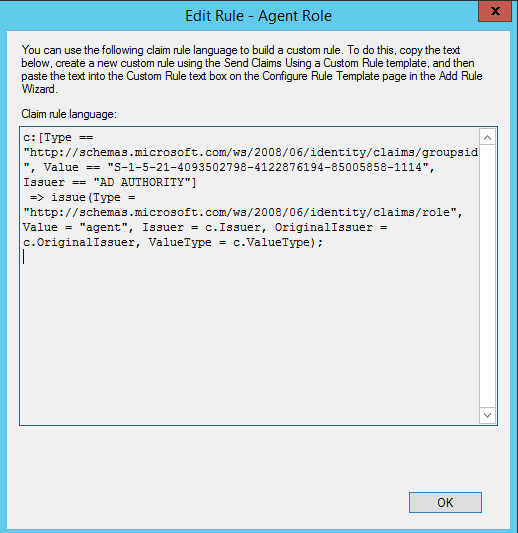 Paste the code you copied into the custom rule editor, and then delete the "http://schemas.microsoft.com/ws/2008/06/identity/claims/" string from the Type field. This should leave only the word role. Custom role mapping will only work if the user already has a role of agent. Are we able to map an attribute to place an agent in a certain zendesk group? I'm guessing this may be an issue because the agent role needs to be given first, but I'm curious on what's possible. I haven't seen any examples in the documentation regarding mapping an attribute for group access, just for organization. Table 1 in the following article outlines supported user attributes for SAML SSO - unfortunately group isn't included. Regarding updating an agent's role, you're correct - in order to update their role via SSO you'll need to enable SAML SSO for agents and admins. Why has the Microsoft ADFS - SSO Server certificate been updated? Does Zendesk Support integrate with Azure Active Directory SSO?